My future son-in-law Nathan is a personal trainer who wants to start his own training company. He isn’t in the position to open his own gym, so after a lot of strategizing, we decided to have him start by developing a website and becoming a social media expert in his field. As I’ve helped him work through the process I’ve realized that anyone can do this stuff. Nathan knew absolutely nothing about websites and beyond having his own Facebook profile had never done anything on a professional level with social media. He really was a blank slate when it comes to designing and putting together a website. Before we could start doing anything we had to find and create an attention-grabbing name. Catchy blog names are a critical part of your marketing efforts. 1. Brainstorming potential website names, phrases, and terms. Nathan knew he wanted a sports/fitness related site, so we started with the thesaurus and began working our way through related words. At this point, nothing was thrown out. I wanted as many fitness related words to choose from. The more the merrier. We combined random words together and had fun trying to come up with catchy, memorable names. We came up with some pretty stupid stuff, but by keeping our thought process open, we also came up with some creative ideas. I know that sounds like a lot of names, but trust me when I say virtually all of them will already be taken. Once we had a very extensive list of catchy websites names we narrowed it down to terms that he liked. Then came the hard part – finding a domain that was actually available. I typically search using Bluehost to purchase my domains. I use Siteground for hosting, but like to keep my domains on a separate platform. If your domain is unavailable in .com, Bluehost will suggest other endings like .net or .org. If possible I recommend a .com name. Most people will automatically type in .com and it takes a lot of education to change people’s automatic habits. Bluehost will also provide a list of alternative names further down the list. Most of their suggestions are junk, but every once in a while they come up with a winner. The vast majority of website domains are $9.99 to $19.99 annually. I do occasionally see .us, .co and some of the lesser domains available for less than $5 annually. You may occasionally see catchy website names that are up for bid. If you want to spend the money go for it, but personally I’d rather spend my budget on the site itself. I can usually find a good name without resorting to paying $1,000 or more. I would also avoid the companies that will “lease” you a domain name. You will end up building name recognition for a site that you don’t even own. If you successfully develop the website at some point you’ll still need to purchase it. If they choose not to sell the site, you are out of luck and have lost a lot of time and money developing a catchy blog name for someone else. As I search Bluehost I write down the prospective names. My list of 100+ names typically dwindles to 10-20 names if I’m lucky. From there I just narrow down the field until I find a name I like. 1. Does the website name reflect who I am and what my site is trying to accomplish? For example, Nathan would like his site to be a fitness resource. He wanted a name that reflected a professional image, that wasn’t cheesy and that would instantly tell a reader what his site was about at a glance. Before choosing your website name, think carefully about the image you would like to portray. A consultant is going to want a completely different name and feel to their site, then a fitness guru. Don’t get so caught up in creating a catchy name that you shoot yourself in the foot because it isn’t descriptive of your goals. This is why it is so important to have a handle on your target market and know who and what you will be writing about. All the catchy blog names in the world won’t save you from no traffic land if you can’t attract your target readers. 2. What are the marketing prospects you can associate with your name? Even if you are only creating a blog – you are still marketing yourself. Choose a name that will allow you to be creative with your marking efforts. This is especially true if you will be marketing a product. Nathan eventually wants a clothing line that is tied to his name. Is he thinking big – yes, but I’d rather plan for the future and set the groundwork for success now then have to rebrand 2 years down the road. Your domain name is going to be irrevocably tied to your product. Make sure that the name you choose is something that will work long term. 3. Is the name easily readable and easy to spell? Unless you have a huge marketing budget and the time to educate your audience your best bet is to find a domain name that makes sense to your readers. You want a name that has standard spelling and that rolls off the tongue. You want it to be a name that will stick out in their mind. Domain names can be up to 67 characters long. Keep your name as short as possible. Avoid dashes, using numbers or other characters that may throw people off. Special spelling may look cute but isn’t as effective when you are trying to explain that you are spelling Cat with a K instead of a C.
Your job is to educate people about your product or service, not educate them on how to spell your catchy blog name. Look at your competitor’s sites and make sure that your blog name will stand out. Years ago we had a company called Stat Read (Digital Radiology). This was before the Internet was big, but one of our competitors was StatRad. They got a jump on us with their internet presence. Eventually, we ended up completely changing our name to avoid confusion. We could have tried to capitalize on their presence, but in that particular industry, it wasn’t worth the customer confusion it caused. If you are in a saturated industry make sure your website name stands out and will set you apart. 5. Are the applicable social media names available? I’ve found decent domain names before and then realized that the twitter handle was already taken. Getting the same name for everything is very rare, but you want to find a domain name that will translate across multiple platforms. On a side note, be aware the longer domain names don’t always translate well to social media handles that have limited character lengths. I’ve run into this issue a few time with my web domain name. The more times people see your name and connect it with your website, the more likely they are to follow you in the future. Choosing a domain name is a key component of starting your online presence. If your name accurately reflects who you are and what you are trying to accomplish you will have a much easier time attracting visitors. 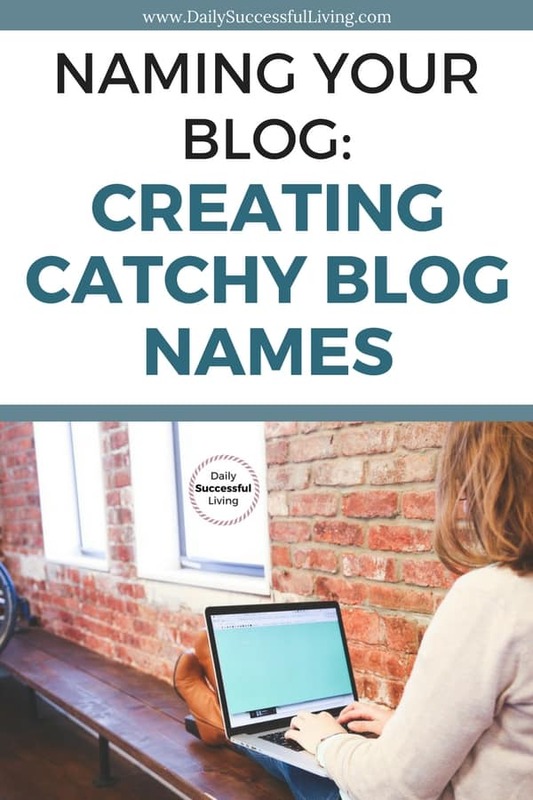 Catchy blog names will catch attention quicker than boring names. When I started this blog, I loved the name Daily Successful Living and thought it would be great. However, since then I’ve shifted the tone of my blog and really wished I had chosen a name that was easier to spell, was shorter and gave a better idea of what my blog actually covered. Over the years, I’ve made the name work, but occasionally still have those moments of regret. I didn’t know then what I know now about marketing and blogging. Don’t rush into your decision. Take the time to do your research and find the perfect cathcy blog name that will reflect your future site. Good luck with your domain searches and if you want a second opinion, leave a comment below.